Looking for some family fun? Look no further than Bella Vista, where you can rent a vacation home as a base to outdoor and indoor activities galore. Bella Vista is a four-season recreational hub. In the summertime, joyful squeals of children can be heard across the lake. The smack of a golf ball hit off a tee, the splash of water from a kayak paddle, or dirt crunching under hiking boots and mountain bike tires are ubiquitous sounds in several seasons, including Arkansas’ mild winters. Fishing is great year round. Within 20 minutes of travel time, you’ll also find shopping, dining, and state-of-the-art museums such as Crystal Bridges Museum of American Art and The Scott Family Amazeum. Plus, attractions like Terra Studios, home of the Bluebird of Happiness, offer artsy, magical fun. Crystal Bridges Museum of American Art spans five centuries of American art from Colonial to current day. Plus, the museum on a 120-acre landscape includes a restaurant, museum store, library, 3.5 miles of trails and a Frank Lloyd Wright house preserved and relocated on the grounds. The Amazeum is a 50,000-square-foot family discovery center and learning laboratory featuring interactive science, technology, engineering, art and math activities. In other words, kids are learning while having fun in a tinkering studio, tree-inspired climbing canopy, indoor water area, outdoor space, and so much more. Another family-friendly locale is The Walmart Museum, telling the story of Sam Walton’s origins and the growth of Walmart through interactive exhibit galleries. Most popular is the dime store full of nostalgic candies and toys, and a 50s-style soda fountain. Also nearby is Terra Studios, a wonderland of art. Here you can watch glassblowers create the world-famous Bluebird of Happiness, buy unique gifts in the gallery of 100-plus regional artists, play giant games, create art in a class, walk the labyrinth or visit the wizard room. Also check out War Eagle Cavern and the Daisy Airgun Museum. Shopping in the area is plentiful too, at large malls (indoor and outdoor), along with unique boutiques. Dining can be lakeside, in a sports bar and golf course pub, or at well-known regional restaurants. While staying or living in Bella Vista is required for access to some amenities, all dining facilities are open to the public. Seven lakes provide fishing, boating, skiing, kayaking, and swimming opportunities. Loch Lomond is the cities largest lake at 477 acres. It has ample room for skiing in its main channel as well as secluded coves for anglers in search of largemouth bass. It’s the only lake with a full-service marina. Three parks around the lake also offer boat ramps, courtesy docks, fishing piers, picnic tables, grills and restrooms. Lake Avalon is 67 acres and the largest of Bella Vista’s “no wake” lakes. A new swim beach opened on Lake Avalon in 2018. The large sandy beach has a swim area, beach volleyball courts, paddle board and kayak rentals and a small concessions stand. Located at the center of town, Lake Norwood is the most accessible and popular for picnic lunches on tables overlooking the water. Lake Windsor at 220 acres is also popular for skiing. All of the lakes are great fisheries for a variety of species such as largemouth bass, bluegill, redear, catfish and crappie. One is even stocked with trout for winter fishing. 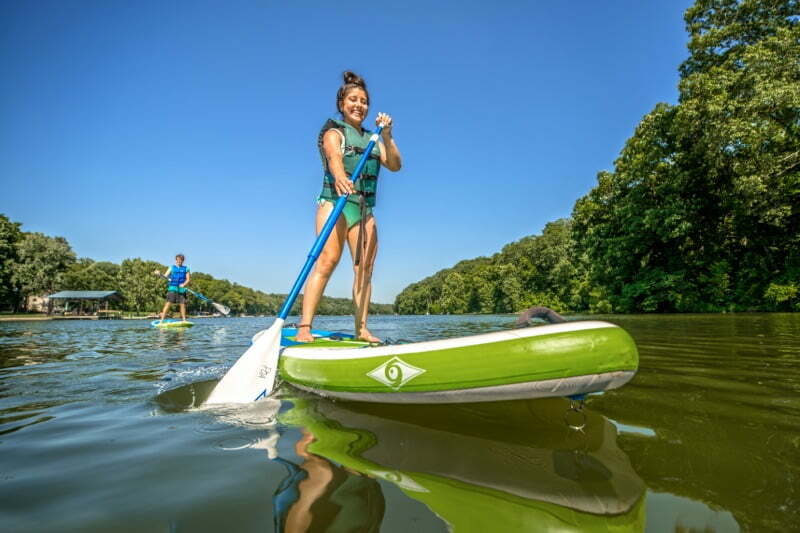 Additionally, kayaking and paddle boarding have become extremely popular on all of Bella Vista’s great lakes. About 35 minutes away is Beaver Lake with 487 miles of shoreline highlighted by limestone bluffs. In addition to lake fun, golfing, biking and hiking are other uber popular outdoor sports in Bella Vista. Six golf courses dot the landscape, plus there is a practice center and driving ranges. More than 40 miles of mountain biking and hiking trails draw outdoor enthusiasts. For those traveling with furry family members, Loch Lomond Trail has access to a dog park. Lake Bella Vista Walking Trail is a great choice for families. The 1.75-mile level, paved trail loops around Lake Bella Vista, offers playground equipment, and connects to the Razorback Regional Greenway. The multi-use paved Greenway runs more than 36 miles from Bella Vista to Fayetteville, linking to parks, downtowns, local breweries, and additional trails along the way. Tanyard Creek Nature Trail is popular with a small paved portion through open green space, and a well-maintained natural surface through wooded and hilly terrain. It passes creeks and connects to the top of Lake Windsor Dam, taking hikers past a beautiful waterfall. Bella Vista also offers tennis courts, numerous parks and pavilions, outdoor and indoor swimming pools, and fitness centers. In addition to great home rentals for vacationers, Bella Vista has a great camping area with 64 RV spaces plus tent and primitive camping. The scenic park has picnic areas, a restroom and shower facility with laundry room and lunge, wireless internet service, and access to Blowing Springs Trails and The Back 40 Trail. Make Bella Vista your vacation hub for making memories with your family. 11 Under Mountain Biking Trail – Coming Soon! Discover BELLA VISTA © 2018 All Rights Reserved.